This month’s cover illustration is the program from a 1925 football game between Denison University and Ohio Wesleyan University, two liberal arts colleges located in central Ohio. 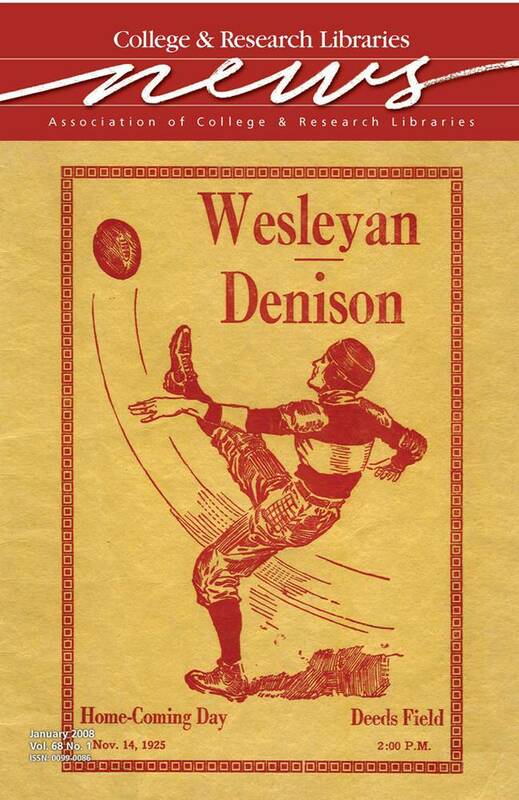 The game program was produced by Denison’s “D” Association, an honorary society for athletes who earned a varsity letter. In 1925, Denison University’s 13th Homecoming weekend celebration began with a pep rally and bonfire Friday night. A Saturday luncheon for alumni and faculty was followed by a parade to Deeds Field, where fans crowded the stadium. Despite the celebration, Denison’s Big Red team suffered a 26 to 0 loss to the Battling Bishops of Ohio Wesleyan. The program is held in the Athletics Collection at Denison’s William Howard Doane Library. Visit www.denison.edu/library" for more information.